I was privileged to attend the NCSBA (North Carolina State Beekeeper’s Association) meeting this month. In 3 days I learned more about bees than I have time to write! First of all, that opinions concerning colony management practices are just as diverse as beekeeper’s personalities. On a more serious note, I also learned that pesticide residues in wax are crippling our bee’s immune systems. Also, bees have a Johnston organ in their antenna that is used to detect vibrations made by sound waves. Then, I learned that making honey is essentially making bees, and much more! I enjoyed listening to beekeeping professionals like Maryann Frazier, Buddy Marterre, Ed Levi, and several others give lectures; sharing their knowledge and advice. I said all of that to say this: being informed and involved is of utmost importance. That is, next to keeping your bees alive. One of the first things we tell people who have just started with bees, or someone that is considering becoming a beekeeper, is become a part of your local beekeeping community. It’s a great place to get started. You can learn most of what you need to know from people with plenty of experience and they can give you support that you won’t find anywhere else. After all, only the people crazy enough to keep boxes full of stinging insects will understand your desire to do the same thing. Beekeeping clubs or meetings are great places to learn about the most recent news from the world of bee research as well as the old ways of dealing with problems that are new to you. Beekeepers are usually as sweet as honey and more than willing to help other people learn about bees and beekeeping. When you get into a group of people that have the same fascination for these insects as you do it’s very encouraging. Not only is it encouraging but it’s educational and inspiring. You can learn about the different methods of beekeeping and improve your own just by getting to know other beekeepers and how they do things. 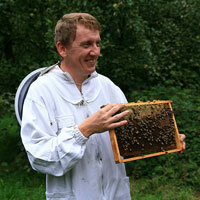 Beekeeping organizations also offer a lot of knowledge and advice. There are many national organizations and honeyo.com has a list of links to several websites for organizations in other countries. These meetings are great places to learn a lot and sometimes you can meet really nice people there as well. There is nothing like learning from a real person, either. You can read all you want but you won’t learn as much as you would from someone with plenty of experience. I understand that becoming part of a club or organization may not be an option for everybody and in that case you just have to learn what you can from good beekeeping books and websites. Forums can also provide very useful information from real people, just over the internet. There is plenty of knowledge out there but there is a special wisdom that comes from experience that can only be shared with spoken words. The world of beekeeping is deep and wide. There is more than enough learning in it to keep anyone busy. So much that scientists and researchers are still learning! So dive in and get involved, you won’t regret it.